Grandluxe is launching a new website and, as part of the fun, they sent me three products from their Monologue™ line–an A6 and an A5 Basics Sketchbook, and an A4 Sketchpad. The paper in all three is the same fine Italian paper, and I like to share the wealth, so I left the A6 untouched and am giving it away! The Giveaway is closed and the winner, Dan Goldman, has been notified. The blurb from the current Monologue website says ‘Monologue is a series of lifestyle diaries, stationery and accessories that are made with the finest synthetic leather polyurethane in different colours’. You can see that these three items I’m showing you today barely scratch the surface in the number of Monologue products. Weight: Italian Heavyweight 140 lb. 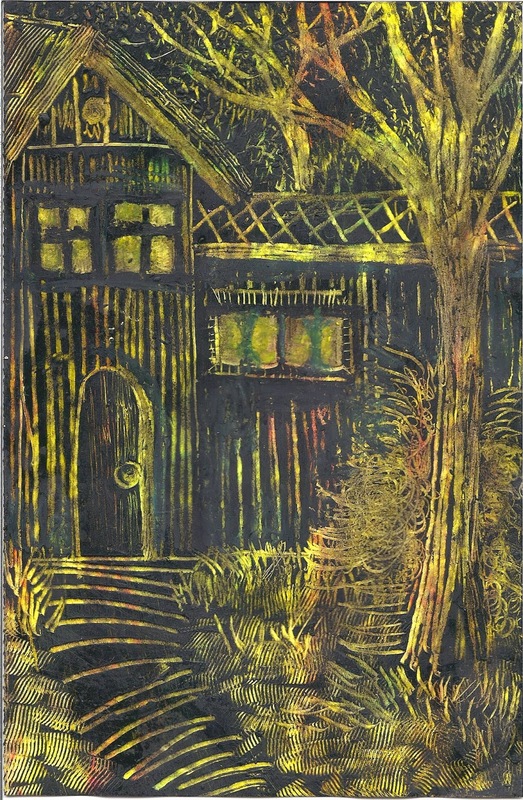 Description from the Monologue Sticker: This paper has a rough surface suitable for drawing with the following techniques: Charcoal – Chalk – Graphite – Pencil – Pastel – Oil Pastel – Wax Crayon – Red Chalk – Acrylic – Collage – Oil – Marker – Spray – Tempera. This is a nice paper. Although the sticker description calls the surface ‘rough’, it feels fairly smooth to the touch. 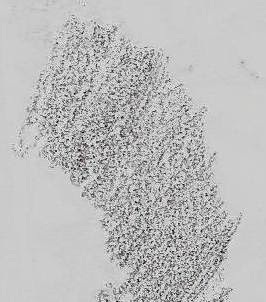 You can see the texture, though, when you use pencil. I later erased these pencil markings with a cheap pencil eraser, and the graphite came away easily, returning the paper almost to the original white. A good eraser would probably do better yet. When I painted over the erasure later, I detected no difference in absorbency or texture. There is nothing in the specs concerning the paper color, but it looks like a natural white, to my eye. It is thick enough to feel solid, but still be flexible. When you hold it by the corner and wobble it, it has the bright metallic sound that I associate with good paper. 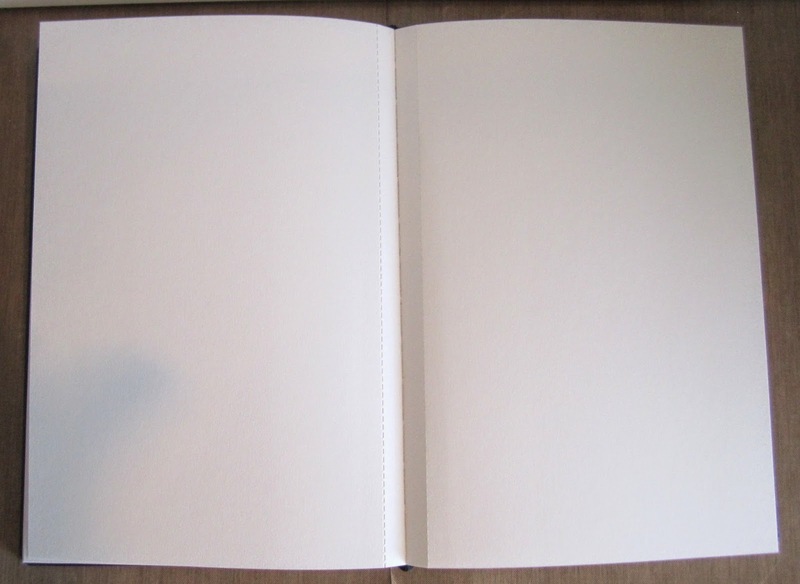 The two basic books have perforations for removing the paper, while the sketchpad does not, though its pages are also removable. With all three books, I held a piece of paper by the corner and shook the book to make sure the paper wouldn’t come free or tear or crease. All three held up well, yet the paper was easy to detach if you started in the corner and pulled so the pressure was on the perforation (or in the case of the sketchpad, where the pressure was at the glued binding). The two Basics Monologue Sketchbooks are very similar. Both have round corners and a cover that has a leather-like texture (you can see the texture in photos below). They are plain black with the ‘monologue’ slogan embossed on the back. The cover’s texture is clear to the eye, but it feels almost smooth to the touch. 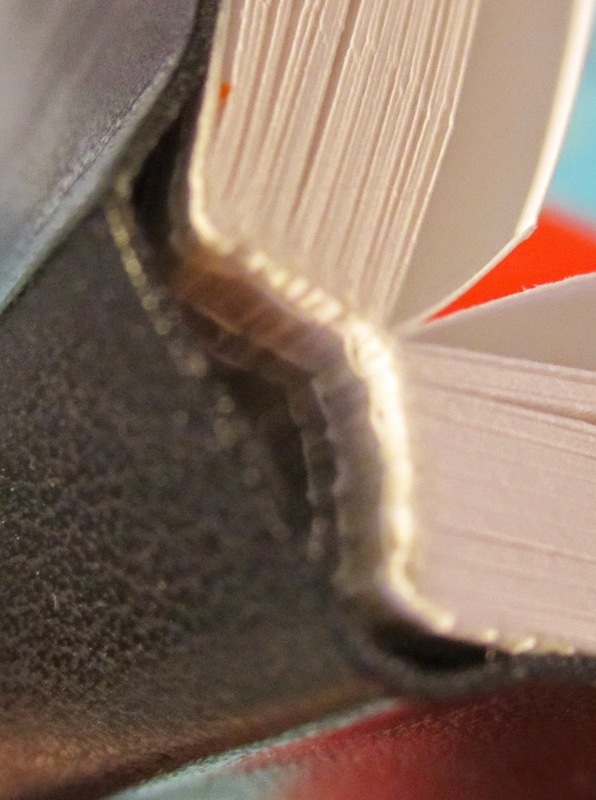 Because the pages are perfed, as you leaf through the book, sometimes the perforations catch on one another, producing a surprisingly loud, cracking sound. 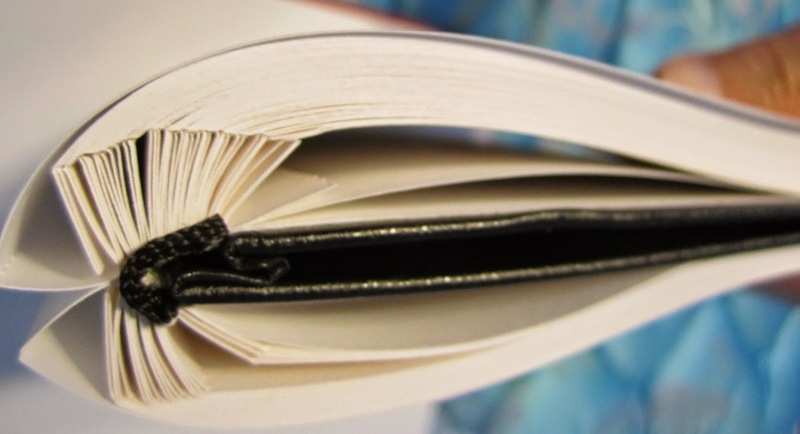 The front and end pages are the same stock as the paper throughout the book, and there is no end pocket. I find I actually prefer that for a sketchbook, because if you have something in a pocket it can interfere with your ability to sketch. On the other hand, I know some people do use those pockets. Although both books look similar, one of mine is a soft cover and the other a hard cover. As of the time I write this, I don’t know if each size comes only in this specific cover, or whether each will come in both. I suspect both. 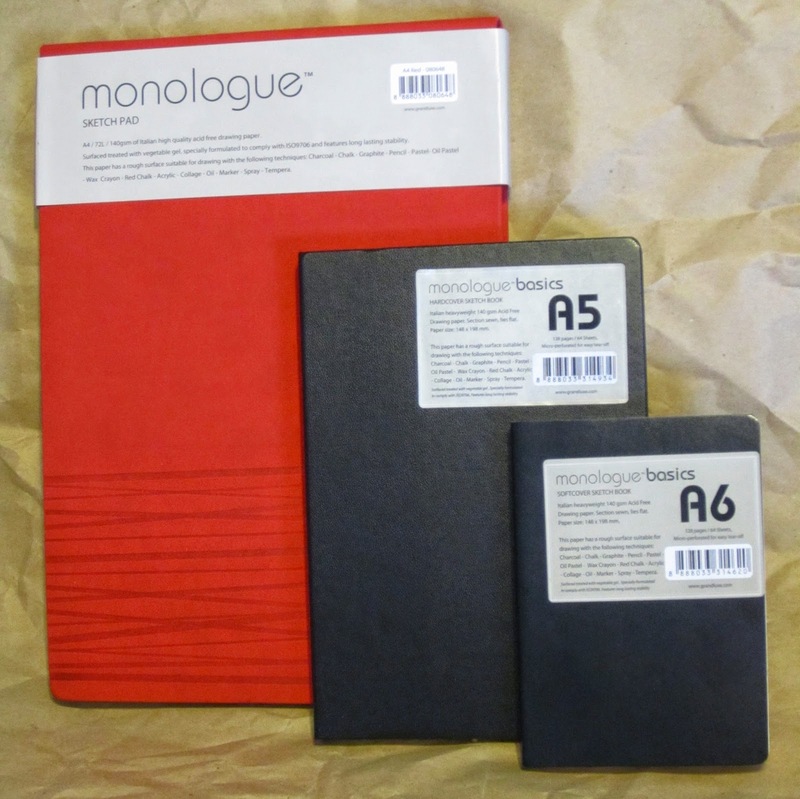 My A6 Monologue Basics has a soft cover in a leather-like material. It is slicker to the touch than the other book. The covers are flush to the pages with no overhang. The A6 size is a good one for carrying in a purse or large pocket. As there is no elastic band, I’d be careful in how I carried it, though, to prevent damage to the pages. …but when you open the book, the spine pooches out, and you might damage it if you tried to fold it back cover to cover. Since I’m giving this book away, I didn’t want to force it in order to find out one way or the other. The A5 Monologue Basics I received has a hard cover with very little flex. The cover slightly overhangs the pages. 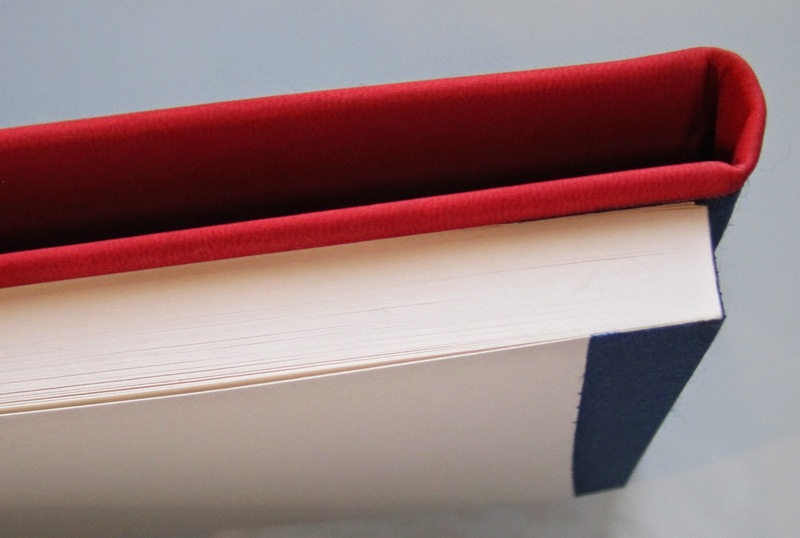 The binding has an extra row of stitches at the top and bottom that is missing in my softcover version. I’m not sure if this has to do with size or soft vs hard. The pages lie flat when you open it all the way, and you can fold the book back cover to cover. As you can see from the photo, though, the perforation stubs keep the paper from lying flat when folded this way. Folding back does cause a slight crease in the spine, though no cracking. Colors: Grey, Orange, Blue & Red. The cover material is quite different in both look and touch from the Basics. It has a small grain that creates a velvety feeling, and the design is debossed deeply enough to create both visual and tactile delight. The beauty of the pad was my first impression. The second was of weight. It is a large size, so I wasn’t surprised, but I suspect even the smaller sizes are heavier than the equivalently sized Basics. 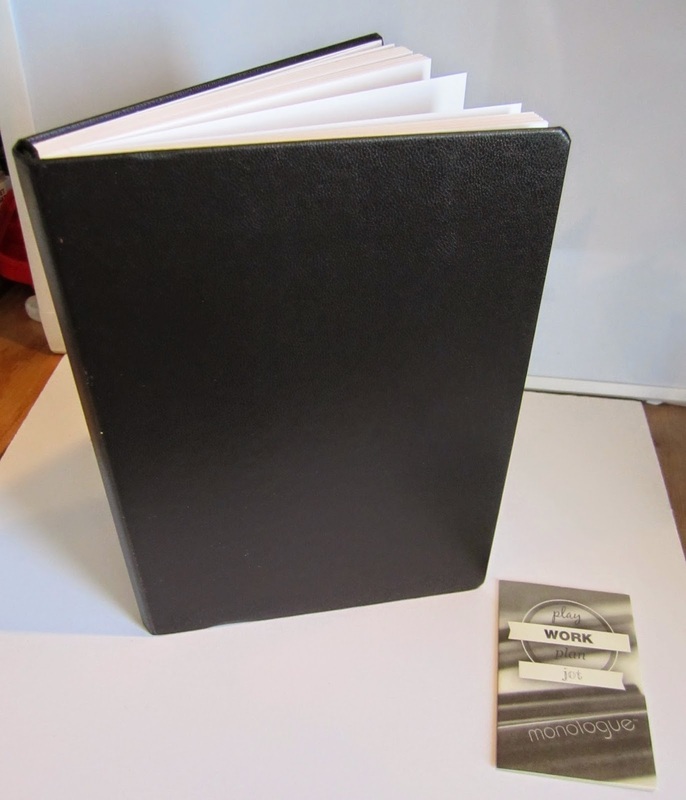 The sketchpad is a top bound hardcover. When I opened it, I thought at first it might be refillable, because the paper pad is only glued down at the back and the sheets are glued to a strip of cloth. This does make it easy to flip the cover and pages back, a plus for a pad this large. With the exception of the very first sheet, the sheets are easy to remove, but unlikely to come loose by accident. In a way, it seems a shame that the pages are removable. The cover is so beautifully done. Even the inside cover is a lovely navy blue material. This would be a wonderful book to keep, but you’d have to hope the pages stayed glued in forever. This pad might be a bit heavy to carry around for travel, but it would certainly grace any desk or table top. The debossed cover is tasteful and elegant without being flashy. 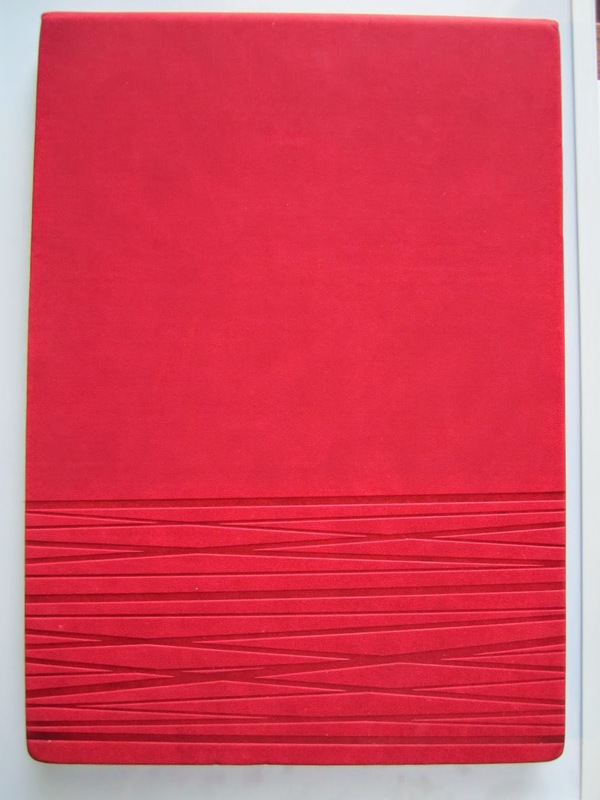 It might still be too decorative for those who like their sketchbooks or notebooks totally plain. The only improvement I’d recommend would be for the paper be sewn in like a book, or the cover be made so the pads could slide in and out, thus allowing the cover to be reused. I know I won’t be removing any more pages other than the one I took out as a test for this review. Did I mention these books had great paper? The sticker blurb says that it is good for: Charcoal – Chalk – Graphite – Pencil – Pastel – Oil Pastel – Wax Crayon – Red Chalk – Acrylic – Collage – Oil – Marker – Spray – Tempera. Sound like great mixed media paper to me! The one thing not mentioned is watercolor, so, of course, that’s the first thing I tried on it. I like to try and break things when I test–that’s how you really find out what a paper is capable of! I wet the entire sheet so it was moist and damp; shining but not to the point where there were puddles. I did get some dimpling, but no curling. Some of the dimples weighted out, but you can still see some of them in the photo. Colors mixed and blended well, and were reasonably intense on the page. I was using neutral colors but you can still see some brightness to them. I was able to lift some color. Pilling occurred soon after I started though, so I didn’t continue. Usually when you use watercolor on a non-watercolor paper, the paper develops a crunchy sound that occurs when you turn the page or wobble the sheet (I kind of like that crunchy sound). While the sound did change with the Monologue paper, it was much less than I expected. While not recommending this as a watercolor paper, I wouldn’t hesitate to use it for watercolor sketching with light washes. The next thing I wanted to find out was whether the paper was fountain pen friendly. It is! This paper is thin enough that you can see the faint shadow of your hand behind it. 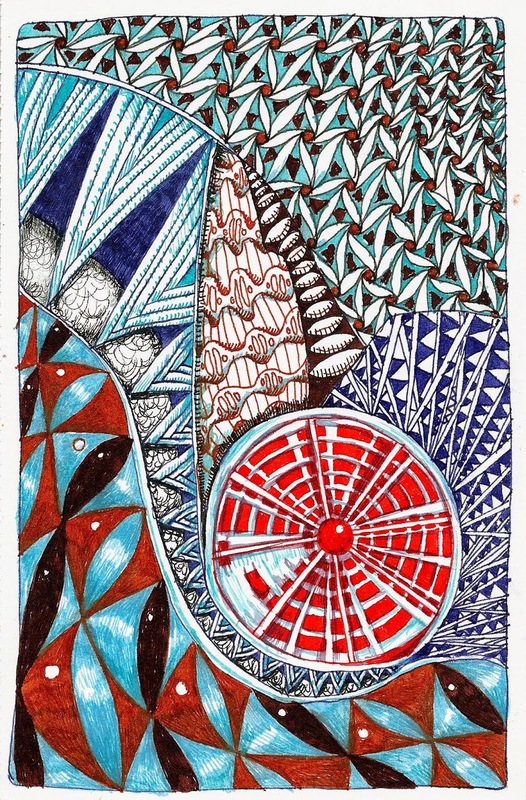 But, after I drew this picture (and I really saturated some areas), there were exactly two pinpoint spots (one from the Noodler’s Heart of Darkness black, and one from the Diamine Chocolate Brown). The colors are bright, but not quite brilliant. Lines are crisp with no feathering, bleeding, and drying times were surprisingly short for a paper that bleeds through so little. From the start, I suspected this would be good mixed-media paper, so it was only reasonable to try some mixed media. I started by applying liquid frisket to the caps and brush handle. I didn’t really need to, but I’d forgotten to use it with the watercolor, and I wanted to see if the paper would tear when I removed it. It didn’t. Once all the paint was completely dry, the frisket peeled off easily and cleanly. I then painted the area and had no pilling that might indicate damage. Next, I glued down a strip of newspaper with a gel medium. There was a bit of dimpling from this, but very little. I drew my subject matter using a black Sharpie marker. It’s notable that the Sharpie ink is the only thing that bled through of all the mediums I used, and it bled through far less than it usually does. 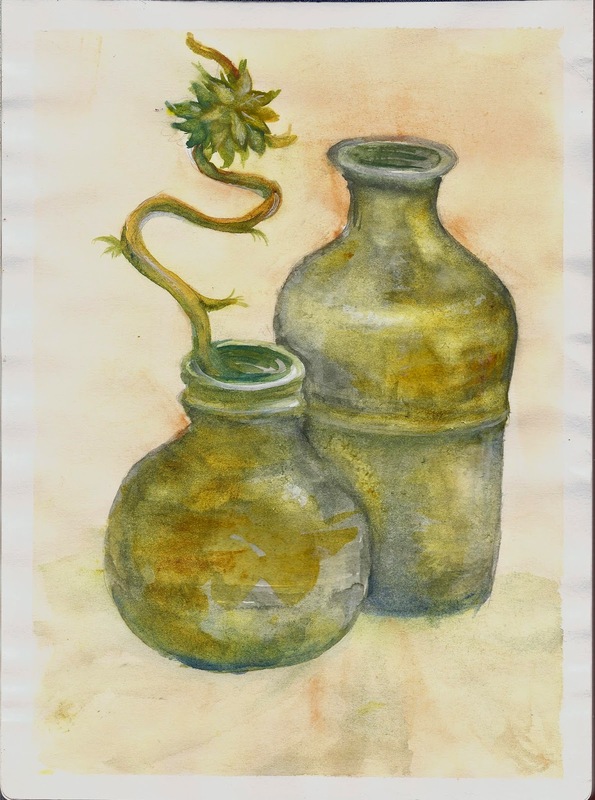 Once the gel medium dried, I painted the bottles with fluid acrylic paint. When that dried, I used a paper towel moistened in alcohol to scrub away highlights, and was able to get close to the white of the paper. 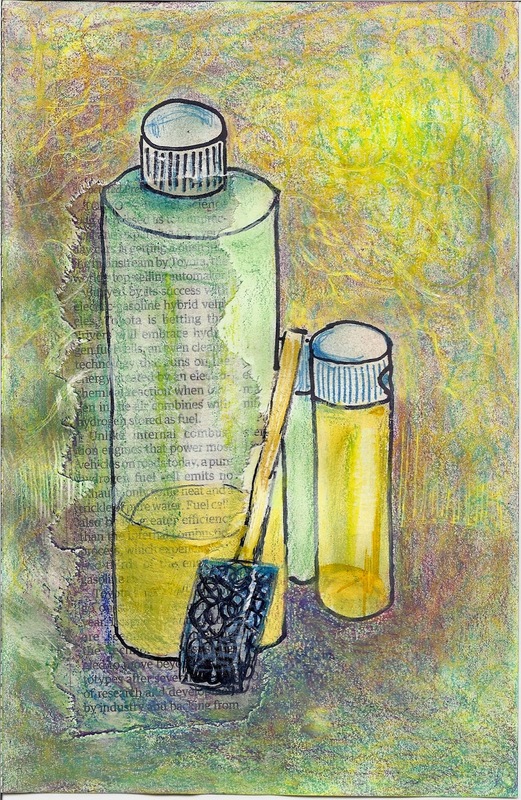 For the background I used Neo-color II’s, which are a water-soluble wax crayon. I squirkled (a scribbly method of laying down color) several colors all over the pages, leaving lots of white between squirkles, and then blended it all with my finger. For the shadows, I wet the crayon with water, just slightly to get a smoother surface. Then I took an exacto blade and did some light sgrafitto (scratching through a top layer to show the color from below). The crayons blended well and easily, both dry and wet, and I was able to layer on enough so there was plenty of thickness for my sgrafitto. Even where I removed the color, scratching all the way to the white of the page, there was no tearing, pilling or fuzz. Even though I used media of different weights, moisture and thickness, the paper stayed flat, except for dimpling when I glued on the newspaper (to be expected). I weighted the paper down when all was dry, and most of the dimpling flattened out. At the last minute, I decided I wanted to do an oil pastel sgrafitto. I didn’t put much thought into it, and I wish I had–I’ll definitely do more of this, though I’m not an oil pastel fan. I used an artist quality (though a lower grade brand) oil pastel and put down a thick layer of yellow and reds. This layer went down smoothly. If you’ve used oil pastel, you know that it tends to leave pills of color. Very few pills were created with this first layer. I did get quite a few with the next layer of black, but that was pastel against pastel, not pastel against paper. Once I had completely covered the yellows and reds with black oil pastel, I used several objects to scratch away my picture–a palette knife, a comb, a clay tool with raised dots. This paper works beautifully with oil pastel, taking the weight well, and pulling the color from the stick smoothly and evenly. 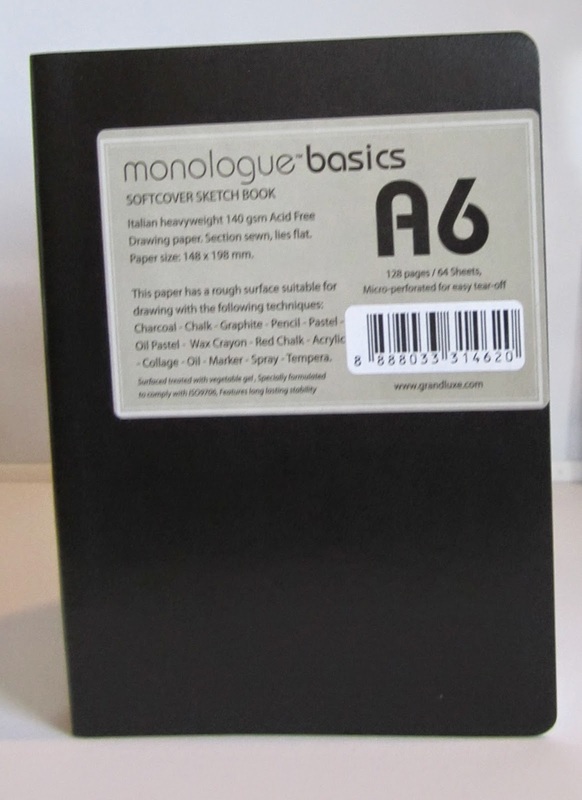 One winner will receive the A6 Grandluxe Monologue Basics Sketch Book that is reviewed here. Cut and paste these words ‘I want to win an ‘A6 Grandluxe Monologue Basics Sketch Book‘ into the subject line of an email, and send it to me at LifeImitatesDoodles [at] Gmail [dot] com. When is the giveaway over? The giveaway started on September 02, 2014 at 06:10 AM PDT and ended , September 07, 2014 at 11:59 PDT. I’ll notify the winner by email on September 08. Anyone. The A6 is small and light enough that I’m willing to pay international shipping. Disclaimer: I received these three Monologue sketchbooks from Grandluxe specifically for this review. I was not asked to host a giveaway, but wanted to share my good fortune with you. All opinions expressed are my own and I received no other compensation for this review. Than you for opening this giveaway to international! My pleasure! I try to do so whenever I can. How marvelous, I have always thought that this kind of sketchbook should invert completely.